all night through his Enlightenment. 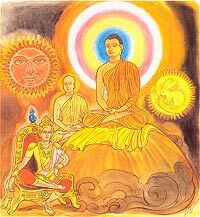 but the Buddha in his glory shines at all times, by day and by night. seventh month (Assayuja) when King Pasenadi of Kosala came to visit the Buddha. the moon was just coming out, both the sun and the moon radiating rays of light. the shining splendour of the king, of the thera, and of the sun and the moon. all times, by day and by night.